Top of Champions League Group A – an absolutely remarkable achievement. We’ve broken records for goals scored, we’ve surprised everyone, both at home and abroad, and we’ve surely been the most exciting team so far – partially due to our dreadful defensive record! Once again, our defence wasn’t much cop on Tuesday, partially due to a flimsy central midfield – with Palacios frequently leaving his post to chase after the ball, and Kranjcar, a stand-in, with Jenas limping off. Assou-Ekotto also had a bit of a nightmare – his worst game for some time- gifting a penalty, and making a number of other poor decisions. The opening goal came from a spot, after a rather innocuous attack ended with Assou-Ekotto raising his arm to protect his face, much like Fabregas just a few weeks ago. The ball is lifted rather aimlessly into the box. Bassong heads clear, but only to Brama (I think), who nods back to Rosales. It’s a sweet strike with his left foot, but Assou-Ekotto should be used to braving these kind of situations, and putting his body into the line of fire. Yes, it’s a natural reaction to protect your face, but it’s very frustrating from a fan point of view to concede such a soft penalty. The penalty is correctly ordered to be re-taken, due to the encroaching of a number of players. Landzaat gets a little lucky second time around. He hits it straight down Gomes’ throat – Gomes gets something on the ball, but it goes straight through him. It’s harsh to expect a goalkeeper to save a penalty, but I can’t help but feel that he should have done better. This header is a thing of beauty – I’ve not seen a better one for some time. The ball is played wide for Chadli – Corluka comes out to him. Corluka shows him down the line, knowing that there are very few players forward. Instead, Chadli stands a rather hopeful cross to the back post – it’s asking an awful lot from Rosales. But Rosales comes up with an unbelievable header. He is a long way out, the cross is not ideal – he has to get up early (and he gets a long way above Assou-Ekotto), and use the muscles in his neck to put a lot of power on to the ball himself. He not only gets sufficient power, but he plants it perfectly into the corner, and beyond Gomes. A brilliant finish. Gomes lines up the wall to protect the right side of his goal. Palacios, for some reason, jumps slightly to his left, and the ball goes right between him and Bale. If you watch the video, you can see Palacios’ strange jump more clearly. 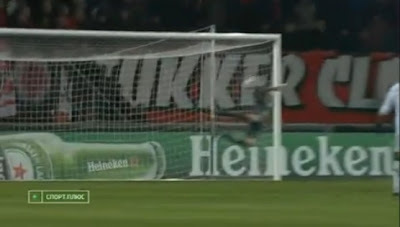 A solid wall, linked and jumping as one, and this ball doesn’t get near the goal. Once through, this is only going to find the net – right in the corner, and well beyond the reach of Gomes, who had stood to the left. Our defensive selection against Chelsea will be interesting. Michael Dawson got 90 minutes under his belt on Wednesday (in a Spurs XI game against MK Dons), and could now be in contention to come back into the side. With Kaboul also returning to fitness, we have four fit centre backs competing for the first time in a while. I can’t help but think that this has come slightly too soon for Dawson, and would expect that Gallas and Bassong will start again. Of course, one option would be to use Kaboul at right-back. Either way, we’ll need to keep things tight against Chelsea, and for me that means that Palacios needs to be much more disciplined in his play – he simply can’t go chasing the ball, and must learn to hold his position. I think "our dreadful defensive record" is a myth from the pundits echo chamber. True enough we have conceded many in the CL - a new experience for the players and our attacking approach can explain much of that. But in the EPL we have conceded the same number of goals as this time last year and have only one less clean sheet. And last season we had King and Dawson at the back and Palacios anchoring the midfield to help us do so well defensively. From watching Spurs and looking at the stats my view is that it is our wasteful strikers who have held the team back and despite the injuries the defence is doing its part very well. Agree totally about Palacios. Jenas getting injured again was bad luck (or judgment was he brought back to early). I thought Niko did a really good job in central midfield. But the last 10/15 minutes he was tiring, which was not surprising given how long since he's started a game. If he'd been substituted when he was slowing up he would have avoided the injury - and I'm not being wise after the event I said it when I was watching the game. Ned - I'm surprised you feel that way - we've gone from a brilliant home defensive record last year, to conceding ridiculous goals on a weekly basis this year. Jill - I totally agree on Kranjcar, thought he held his own. Palacios is a player whose style has never really suited us. He has brought out the best in others (his energy and tenacity has rubbed off on the rest of the squad), but I don't think we look as good with him in the side. Gomes: usual mix of match savers and making the easy look virtually impossible. Positive territory on the whole. Ekotto: poor game overall especially distribution. Actually I love the score more than them approach as much as it must infuriate defensive analysers like yourself. Kaboul as DM is a good shout vs Chelsea, but would Redknapp be worried about bringing him straight back into the hustle and bustle of the midfield after injury? Gomes for me is looking like a problem at the moment - he made some decent stops, but his spills are becoming more and more frequent again. So in fact this season in the league we have conceded fewer goals than last season and scored many fewer too. My point being that we finished so strongly (defensively), and it's a shame that we've slipped back. Palacios fell for one of the oldest tricks in the book and it's something I've noticed we don't employ at spurs. Stick a man on the edge of the wall and as the taking runs up they push themselves into the wall. The man on the outside of the wall pushes back to make sure the wall stands tall and just as the ball is kicked the attacking player moves meaning the defender in the wall has no one to push against and therefore separates away from the wall. That's exactly what happened on Tuesday. When i played football, to a decent standard from people i know but a crap standard really, it was something we worked on in training. Basic tactics at set pieces and something we apparently don't bother with in attack or defence.